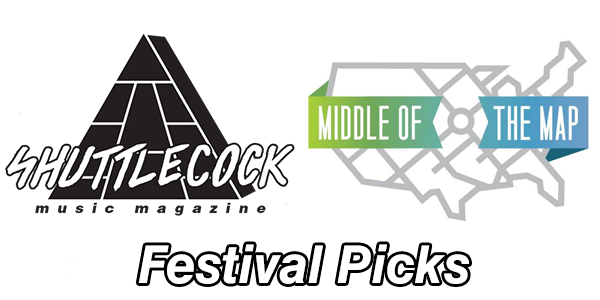 Ink Magazine and The Record Machine have been putting on Middle Of The Map fest for seven years now. The organizers have always booked unique, tough-to-get acts and set them up on bills with some of Kansas City's best bands. Middle Of The Map has brought acts like Fucked Up, Charles Bradley, Gary Numan, Iceage, and Mission Of Burma to town in past years. 2017's lineup isn't a disappointment by any means. Below are some of the acts we're most excited for and why you should be excited for them too. Ro Ransom may have the biggest year out of anyone performing at the fest in 2017. The New York rapper has been preparing his mixtape "Momentum" since last year, and from the singles he's dropped so far, it sounds like he is finally achieving the sound he's always wanted. His song "Invented Swag" shows a mastery of over-the-top brag rapping, while "Doppelgänger" features a more upbeat rhythm and hints at his potential as a massive crossover pop artist. Ransom has been teaming up with notable underground producers like Misogi and Lantz and the sounds he's been laying out with them are nocturnal, modern, and instant ear candy. Ro Ransom plays at CrossroadsKC on Sat., May 6th at 8:10 P.M.
Everybody knows A Tribe Called Quest, right? Anyone even relatively familiar with nineties hip-hop can spit a few lines of "Can I Kick It?" back at you. Often overshadowed by the infamous Tribe is another New York group called De La Soul. For scholars of the genre, they need no introduction. The group's debut album "3 Feet High And Rising" dropped the year before Tribe's debut and provides a rival amount of eclectic samples and feel-good rhymes. The group began in 1987 and has never broken up. With songs as positive as they are, it's hard to see how they could ever quit. De La Soul plays at CrossroadsKC on Sat., May 6th at 10:05 P.M. The title of Mystic Braves' latest album really says it all; it's called "Days Of Yesteryear." From the moment the music begins, the listener knows they're in for a psychedelic trip back to America in the late sixties. Tambourine shaking and organ pounding prevail on many songs, leaving plenty of room for comparisons to The Doors. The band frequents The Growlers' Beach Goth festival in California dresses in a similarly dapper fashion. Expect some of the fest's highest levels of showmanship (and perhaps drug use) when Mystic Braves take the stage. Mystic Braves plays at The Brick on Sat., May 6th at 9:30 P.M.
Kendrick Lamar heard Anna Wise singing with her band Sonnymoon online in 2011. The two got in touch and quickly began recording soon after. Wise has since appeared on 11 songs with Lamar, stretching from his breakout "Good Kid, M.A.A.D. City" to "Damn." The voice that caught the ear of one the biggest names in rap is also responsible for creating gorgeous, self-released R&B music. Swirling melodies and dreamy synths spill from nearly every track as Wise tackles a range of songwriting styles. She's already won a Grammy for her work with Lamar, but don't believe that will be her only one. Anna Wise plays at Madrid Theatre on Thurs., May 4th at 7:30 P.M.
Shuttlecock has teamed up with Chris Haghirian's Eight One Sixty radio show at 90.9 The Bridge for a local hip-hop showcase as a part of this year's festival. Catch past Shuttlecock showcase performers Aaron Alexander and Sahvannes with other favorites like Dom Chronicles, DEV3N, Ebony Tusks, Heartfelt Anarchy, Kemet The Phantom, and Domineko. Shuttlecock will also have zines, buttons, and a brand new piece of merch for sale at the show. Don't miss out! Shuttlecock and Eight One Sixty take over The Tank Room on Sat., May 6th from 2 P.M. to 7 P.M. RSVP to the Facebook event to see set times and stay updated. Other acts Shuttlecock recommends are: Zipper Club, Why?, Big Jesus, Mr. Elevator, Talib Kweli, Stik Figa, Indyground Crew, False Brother, Shy Boys, Fullbloods, The Philistines, LION, Hyborian, Momma's Boy, and Berwanger. Middle Of The Map Fest tickets and a full festival lineup/schedule are available here.